The I Ching 易經 (Book of Changes) is a classic book for divination used in ancient China, the surviving edition dates back to the Zhou Dynasty but there were at least three earlier editions (Hsu & Chiu 54 : 2008). It uses the symbols of Ying and Yang to designate objects and changing combinations of the two symbols to represent eight natural phenomena (the basic eight Kwas), developed by Fuxi to represent what will happen to people in eight situations. Over the period of three Dynasties (Zhou), (Xia 2070 -1600 BC), (Shang 1600 -1046 BC) the eight Kwa system was elaborated into 64 symbols with separate designations and interpretations. Zhuxi describes the Emperor Zhou Wenwang separated the 8 Kwas into upper Kwa and lower Kwas, creating 64 Kwa Ts'i and the Duke Zhou providing 6 Yaos per Kwa for the "divination to explain the recycling of things" (Hsu & Chiu 55 : 2008), designated Yao Ts'i. From Hsu & Chu 2008. Each Kwa Ts'i represents a general statement as well as a generalization of the Kwa, while the six Yao Ts'i of each Kwa are detailed explanations of the six situations. Confucius provided interpretations of the Kwa symbols with regards to education and life, a more philosophical approach and further influences over time included Taoism and Mosim. The I Ching was associated with Confucianism, thus part of an undercurrent of Late Choson thought but still essentially not popular as most Confucian scholarship in Korea focused on the "Four Books and the Book of Rites" (Wai-ming 65 : 2000) in Choson Confucianism (Wai-ming 65 : 2000) and had an increasing influence during the Tokugawa period of Japan. The Tokugawa Bakufu (徳川幕府) sought to govern along Neo-Confucian principles, which were argued in terms of rational and humanistic principles, the I Ching was associated with this so its use moved outside the temples into the wider secular educated strata of Tokugawa society (Wai-ming 568 : 1998). During the later Tokugawa period when there were attempts to separate indigenous Shinto thought by Kokugaku Shintoists from introduced Confucianism, many of the Kokugaku Shintoists were influenced by the metaphysics of the I Ching (Wai-ming 583 : 1998). Over time the interpretation and application of the I Ching has been extended to meet the historic demands of the societies where it has been a significant part of the societies intellectual repertoire. 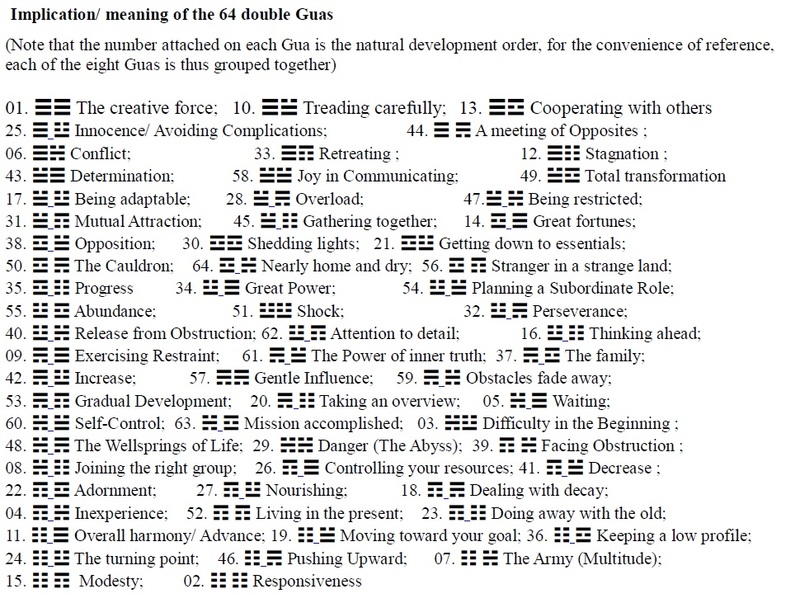 The methodology of using the I Ching can be argued to be a methodology to access intuitive perception, modes of experience which compose two different scales of personality on the Myers-Briggs type indicator, based on Jung's typology model. The I Ching can be described as containing a core of ancient Chinese thought that integrates the "empirical achievements of the exploration of natural and social rules in the long historical development of Chinese civilization by summing them up into subtle philosophical thinking" (Hsu & Chiu 53 : 2008). The I Ching focuses on change and thus the symbols and bibliomancy may contain configurations that may have an interpretive value to events. Thus Hsu & Chiu (2008) have done a study seeking to compare the I Ching's early management decision making models to "western management decision making models" (Hsu & Chiu 2008) with the conclusion that there is similarity between the I Ching's early management decision making model and Intuitive decision making models. 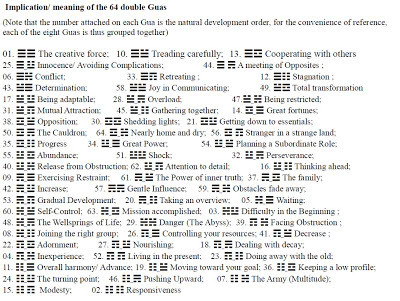 Other papers have made a problematic attempt to represent learners emotional states using the I Ching (Guey 2012) or investigated the effects of belief on using the I Ching for the purposes of divination (Storm 59 : 2002). Guey, Ching-Chung. (2012). A Tentative Model on Emotions under Various Levels of Tension in Learning: Perspectives from Chinese I-Ching. From the International Journal of Business and Social Science. Volume 3. Number 4. [Special Issue -February 2012]. Pages 1 -19. Hsu, Mu-Lan & Chiu, Kuan-Yao. (2008). A comparison between I-Ching's early management decision making model and western management decision making models. In Chinese Management Studies. Volume 2. Number 1. Pages 52 -75. Storm, Lance. (2002). A Parapsychological investigation of the I Ching : Seeking PSI in an Ancient Chinese System of Divination. In the Australian Journal of Parapsychology. Volume 2, Number 1. Pages 44 -62. Wai-ming Ng. (1998). The I Ching in the Shinto thought of Tokugawa Japan. In Philosophy East & West. Volume 48. Issue 4. Pages 568 -583. Wai-ming Ng. (2000). The I Ching in Late-Choson Thought. In Korean Studies. Volume 24. Pages 53 -68.